Sailor Wounded In Chattanooga Attack Dies From Injuries : The Two-Way The Navy says that a petty officer shot in Thursday's attack has died. Officials haven't formally identified him, but his identity has been confirmed as Petty Officer 2nd Class Randall Smith. 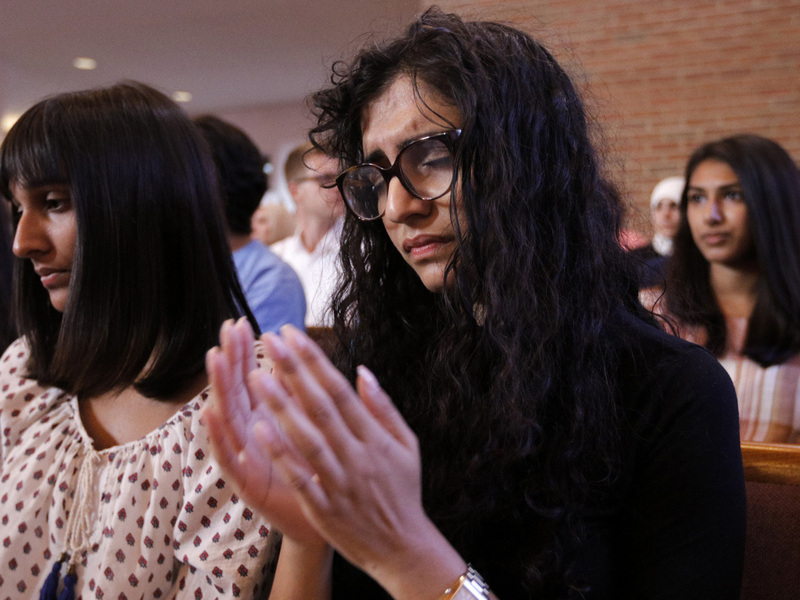 Yusra Siddiqui, right, and Zoha Ahmad, who came with others from the Islamic Society of Greater Chattanooga to offer their support, pray during an interfaith vigil at Olivet Baptist Church held in remembrance of victims of Thursdays shootings. The U.S. Navy has confirmed that a fifth service member has died of wounds sustained in this week's shooting rampage at two military sites in Chattanooga. "A male Navy Petty Officer succumbed to wounds received in the July 16 shooting at the Navy Operational Support Center (NOSC) in Chattanooga, Tennessee July 18 at 2:17 a.m.
"In total, four U.S. Marines and one Sailor were killed in the incident. His name will not be released until 24 hours after the next of kin process is completed." NPR has confirmed, through a member of the family, that the deceased is Petty Officer 2nd Class Randall Smith, who was the only sailor among the wounded from Thursday's shooting at the Navy Operational Support Center. Moshi Ali, representing the Islamic Society of Greater Chattanooga, speaks at the Olivet Baptist Church during an interfaith prayer vigil to remember the victims of Thursday's deadly shooting. As we reported on Friday, the U.S. Marine Corps has formally identified the four other victims: Gunnery Sgt. Thomas J. Sullivan, Staff Sgt. David A. Wyatt, Sgt. Carson A. Holmquist, and Lance Cpl. Squire K. Wells. Emily Siner from member station WPLN reports for Weekend Edition Saturday that the latest death comes as the city of Chattanooga is beginning to process and grieve after the shooting deaths, while Muslims at the Islamic Society of Greater Chattanooga cancelled celebrations of Eid, one of the holiest days of the year. Saffa Abou-Alfa, who came to the mosque for afternoon prayers on Friday, tells Emily Siner that she is scared for her family's safety after she found out the shooter was Muslim. "We don't want to be hated by everybody," she said. "You know, everybody hates us, and it's scary." 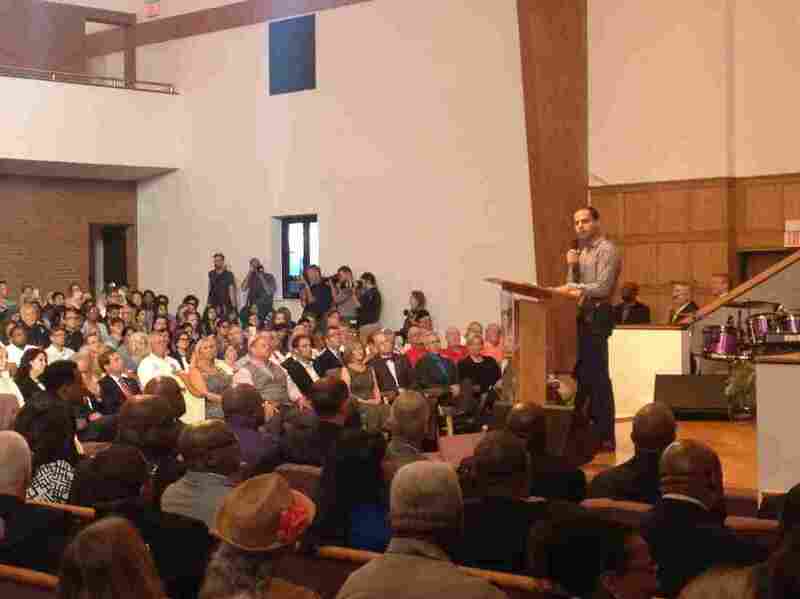 Elsewhere, more than 1,000 people, including many Muslims, attended an interfaith prayer vigil at Olivet Baptist Church in downtown Chattanooga. Citing scripture, Tennessee Gov. Bill Haslam said: "Jeremiah wrote, seek the peace of the city to which you're called. For in its prosperity you'll find your prosperity." "Tennessee has seen several Islamophobic incidents in recent years. In a city just 100 miles away, a mosque under construction was vandalized, and its equipment set on fire. A commissioner in a nearby county once posted a Facebook photo suggesting Muslims should be greeted with a shotgun. But here in Chattanooga, it's been different, says Bassam Issa. He's the president of the Islamic center, and he describes almost ideal relations with the rest of the city. "Every Muslim in this community feels ... that they live in a normal, everyday, any other American. ... Chattanooga itself has been very exemplary," he says.